Deck created for The Iron Yard Front End Engineering class in Durham by team Curagami http://www.Curagami.com. 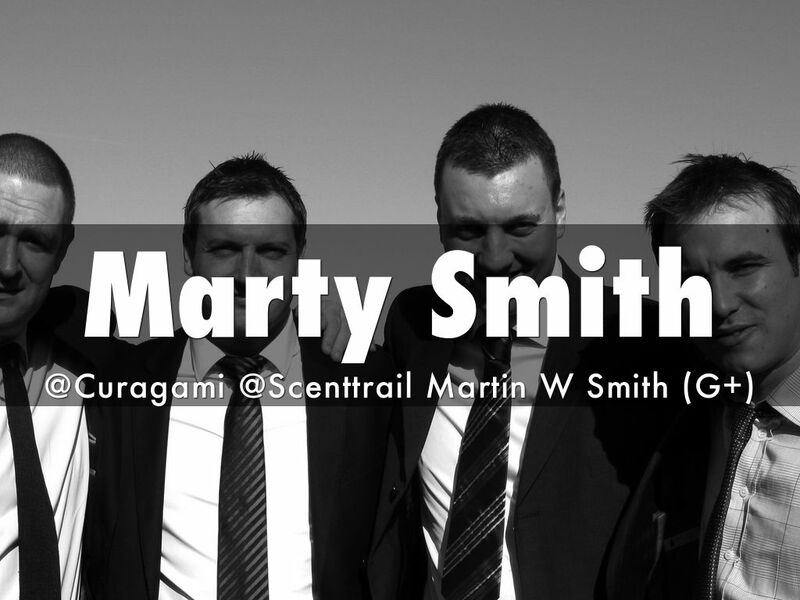 Contact martin(at)Curagami.com with questions, ideas or resources you would like curated in. We applied a "web designer" lens to this deck. 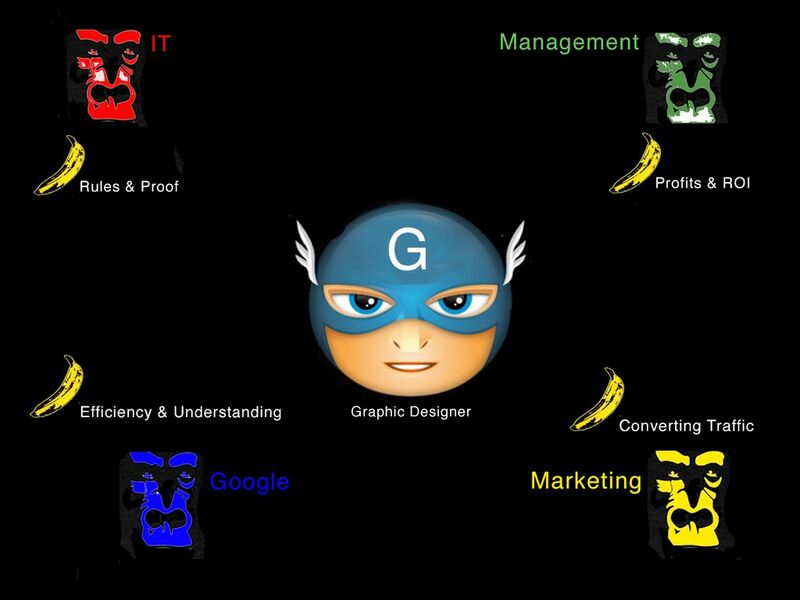 We are not web designers, but we work with them so much we know how important they are to creating winning SEO. When I was a Director of Ecommerce organic SEO was worth several million dollars to the company's bottom line, so knowing something about the ever changing rules of the game is important. What you need to know is often determined by current circumstance like where you work. If you work with a SEO team you won't HAVE to do as much SEO deep diving as if you don't. This deck assumes a front end engineer as the main source of "working" or "technical" SEO. This deck was created to support a presentation to Cohort 3 Front End Engineering class at the Iron Yard Code Academy in Durham, NC. 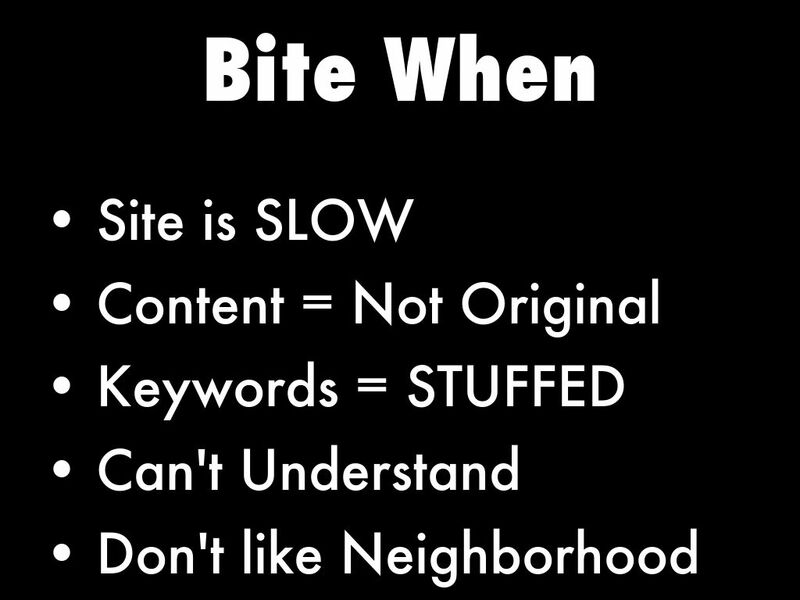 * How keywords create a type of cultural zeitgeist or Natural Selection (of memes and ideas) we think of as the web's "weather"
* Why Keywords matter most (with a natural sound caveat). 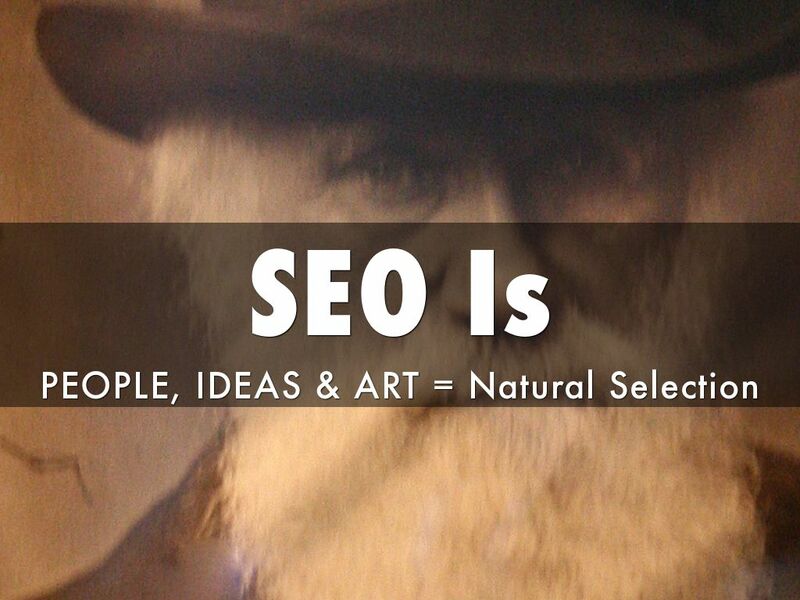 And you will know and understand SEO. 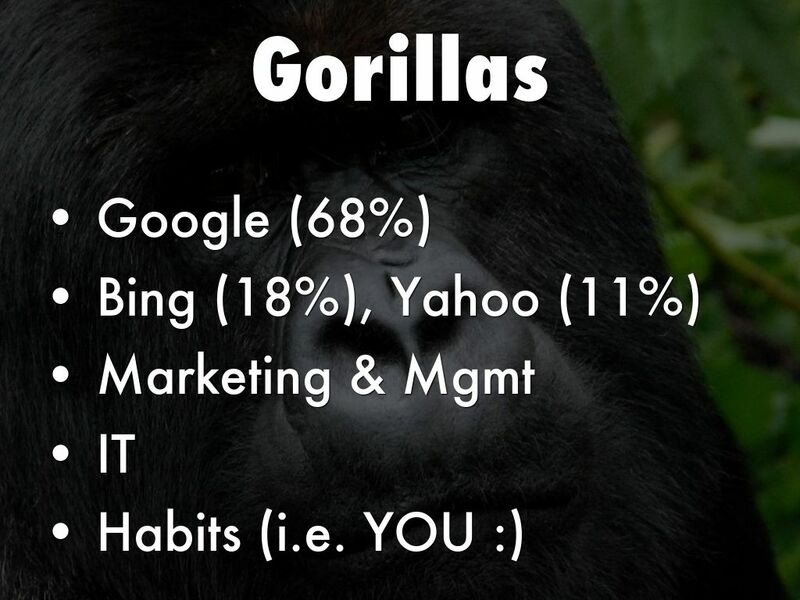 This slide discusses the many players involved in SEO. Someone always ends up in the "Center Square". 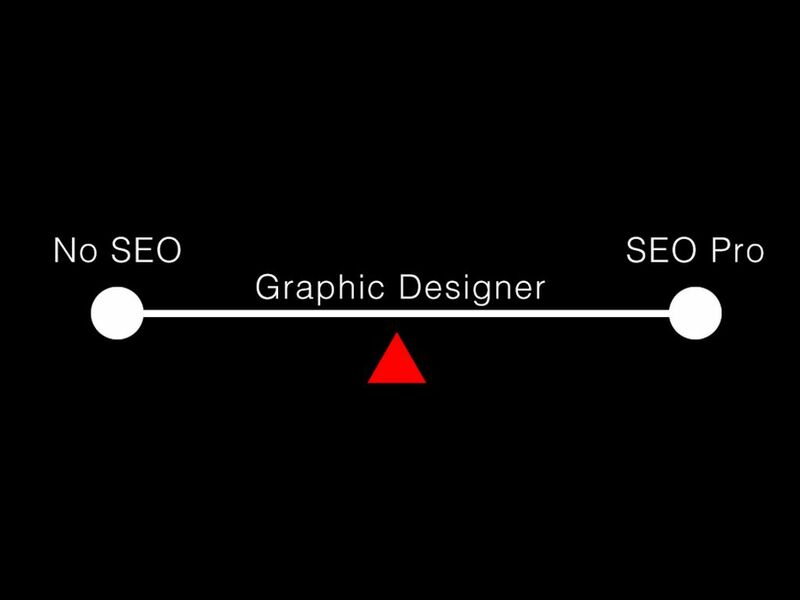 Designers may or may not end up the SEO champion within a team. 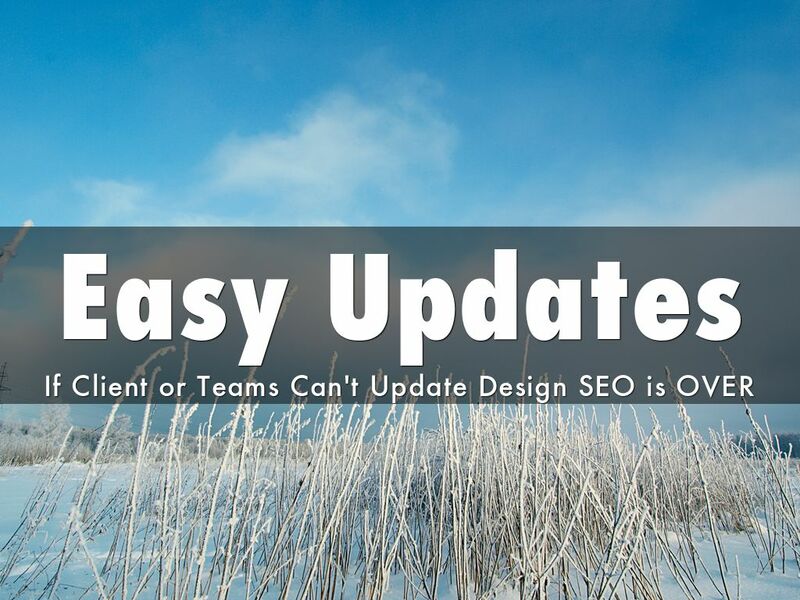 SEO CHANGES all the time, so it's impossible to stay tuned to all the changes in web design AND SEO. That means if you are a designer and you are the lead on SEO AT SOME POINT you will need to insist on help, class or both. Don't get trapped into becoming BOTH a website's designer and its SEO too. NO ONE can do both of those BIG JOBS justice. That said, sometimes you have to bail the canoe. 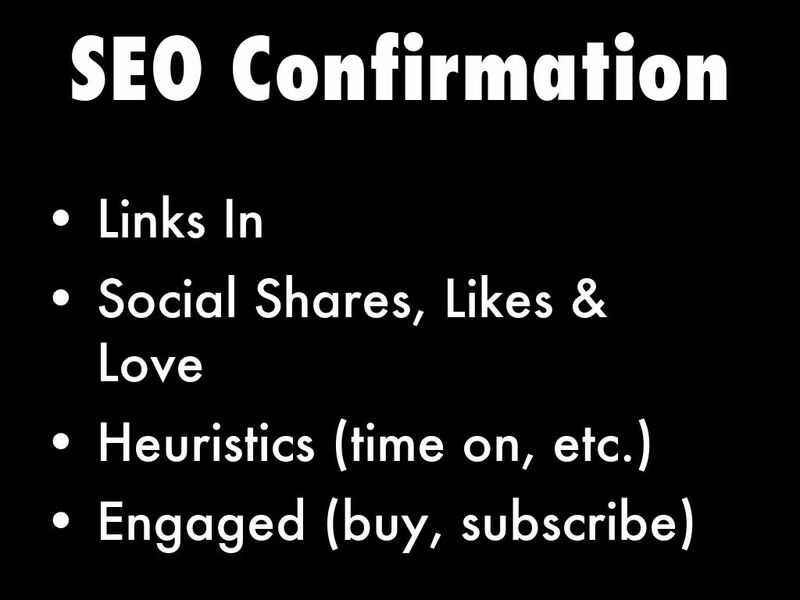 This deck is setup to help you bail a SEO canoe and increase it's speed to some point of diminishing return. SEO "Partners" and constituents are often clouded in mist. Google is many things CLEAR and CONSISTENT rarely among them. Your managers and team may be clouded in mist too. Gorillas, in this context, are forces within a mysterious jungle we must navigate, collaborate with and understand. 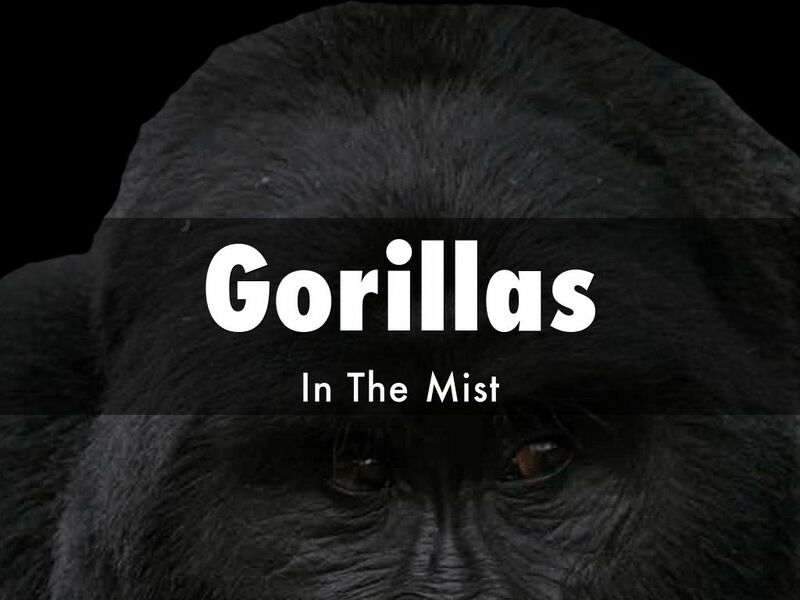 They live in mist because who can really understand a Gorilla? 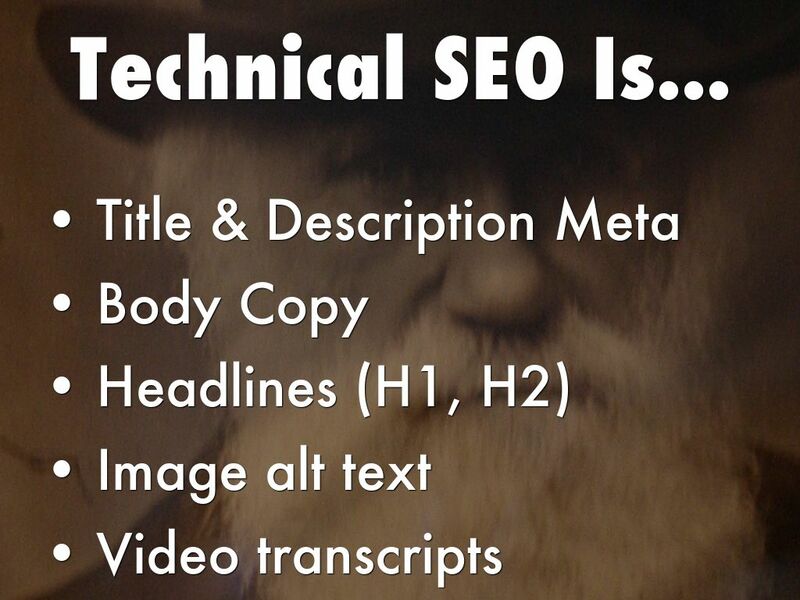 Anyone who says they understand SEO probably doesn't. SEO is a wave best SURFED. By the time you understand it will change 5 times. 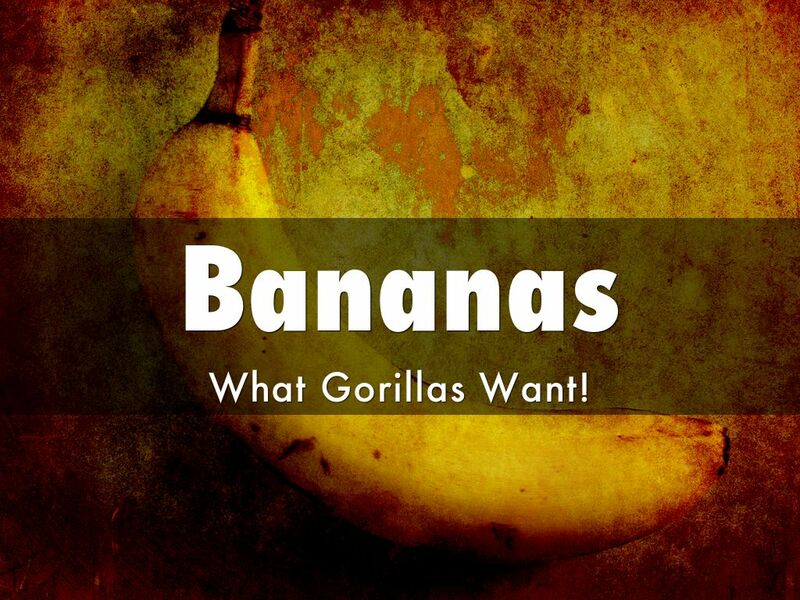 Everyone wants the same thing, BUT how marketing defines their "banana" is very different than Google. In fact Google's objectives and desires can be mutually exclusive. BEST if your objectives and Googles are as aligned as possible. When we are asked how we made $30M+ online in ecommerce working WITH Google is our first thought. Problem is no one "works with Google". Google does what Google does and we react, understand to the best of our ability and gather around Google's fire and howl at the moon. Everybody wants everything all the time. In this forest GOOGLE is the biggest and most important animal. Google's algorithm uses over 200 elements to determine what appears in the SERPs (Search Engine Results Pages). In the old days Google's rankings were absolute. When you and I typed the same search at the same time we saw the same result. Today GOOGLE determines who sees what and why with a nifty invention let's call the Google Float. 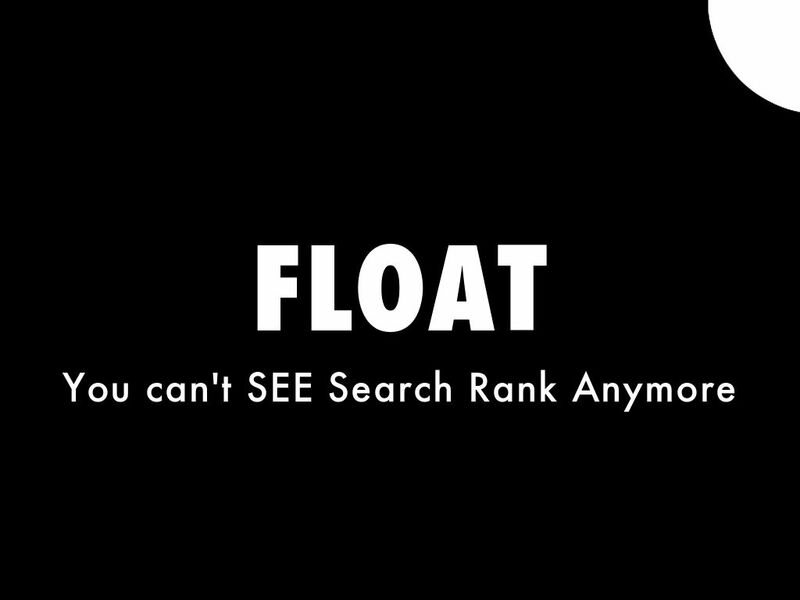 Google's float means YOU CAN'T LOOK at the SERPs and know how you are doing. 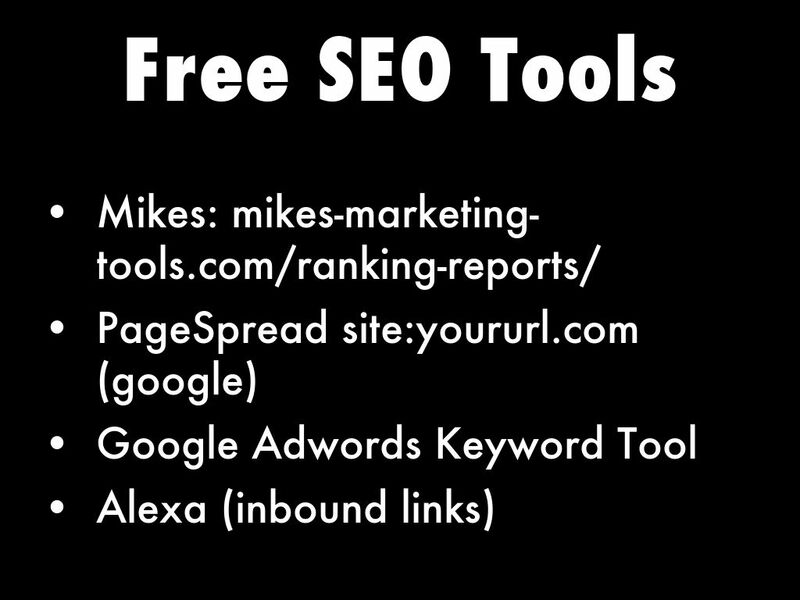 Only way to look inside the float is with tools like MIKES (http://www.mikes-marketing-tools.com/ranking-reports/ ). Google's Float means ANALYTICS with TOOLS is the only way to know and track progress. As we noted, SEO is a FULL TIME JOB. Web Design is a FULL TIME JOB too. It is NOT REASONABLE to ask you (the designer) to know as much as a "SEO" or someone who watches Google's every move. 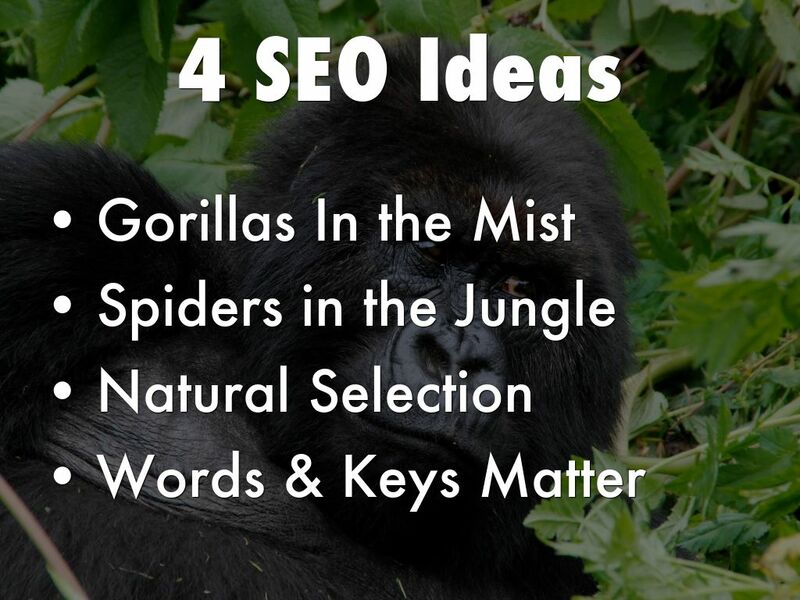 This deck WILL NOT make you a Bruce Clay level SEO expert. In fact there is LITTLE to NO ROI for a designer to take on such a mission. SEO changes too fast and all the time. That said web designers dig ditches that can KILL or MAKE SEO so they need to have a solid working knowledge of "technical seo". And you should commit to following or checking in with a SEO guru like Clay every so often to know what is happening now. Understanding how CODE named search engine spider scrawl a website is important. Google's spiders don't READ what we've all worked so hard to write and style. 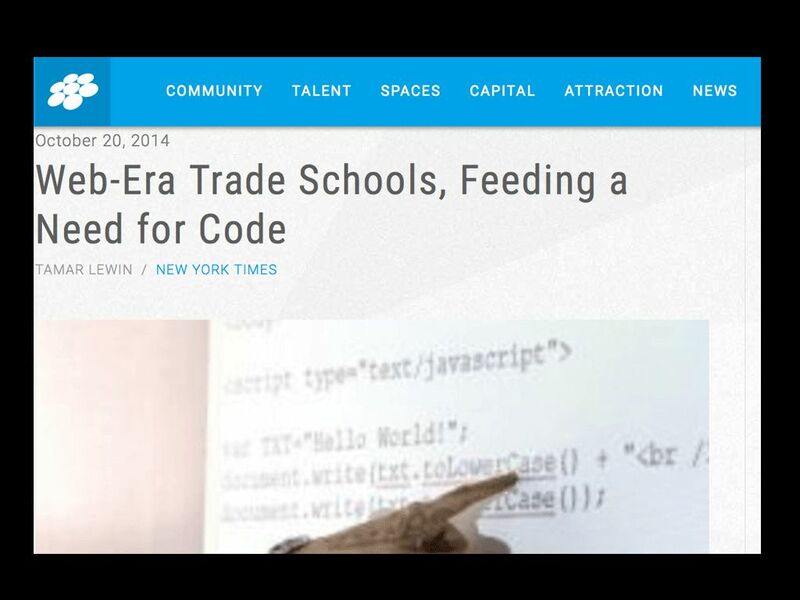 Code (search spiders) "read" in MATH and in set theory. Your site is similar sites. Google knows this and CRAWLS accordingly using rules and predictive analytics to recognize and categorize FAST. Google is all about SPEED because time is money online. 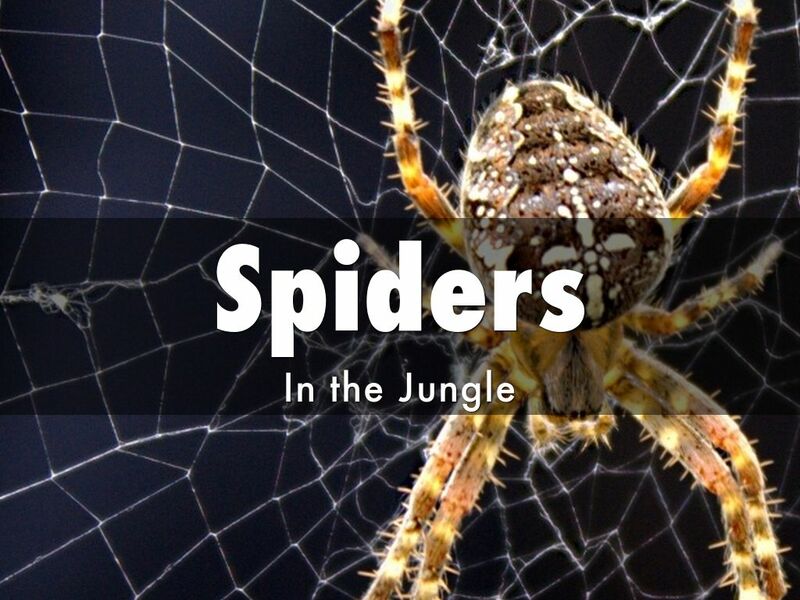 For every fraction of a second your page holds Google's spiders up a demerit is given. Earn too many demerits ad Google moves you site to the backwater where you will need to use other marketing other than organic SEO to create awareness. Thinking like GOOGLE means you delivering on the prime objective = providing relevant traffic to searchers FAST. Oh, and "do no harm" as the Google's famous mission statement said. * Playing within the Rules. * Know that RULES CHANGE and your approach to web design must change too. No one costs Google money for long. When your site helps Google make money you get to make a few shekels too. Rule #2 is key. WHO links to you and HOW matter. Who LIKES and SHARES your content matters. There are many reasons why Google BITES. Some reasons are known, some evolve as we write this. After Google's Panda & Penguin algorithm updates knowing how to keep your content and design CLEAN, UNIQUE and LOVED is beyond important. Explaining concepts such as canonical urls is beyond this document's scope, but understanding canonical urls help safely duplicate content is a great "meta rule". Canonicals (canonical URLs) clearly identify MASTER content allowing Google to ignore (not crawl) SLAVES. Keep SPEED in mind at all times. SPEED, like all things web, changes fast too. When I created a website in 1999 we wanted total page "weight" to be below 75K - absurdly low by today's cloud computing standards. Lack of SPEED kills websites twice - Google hates 'em and customers can't surf 'em. Speed (of page load) is a MUST. We strongly suggest using a Content Delivery Network (CDN) to cache images, videos and other potentially large files. You can't cache cart and other "active" tech, but at least your site should never be DOWN DOWN (i.e. can't be seen or interacted with) with a CDN. 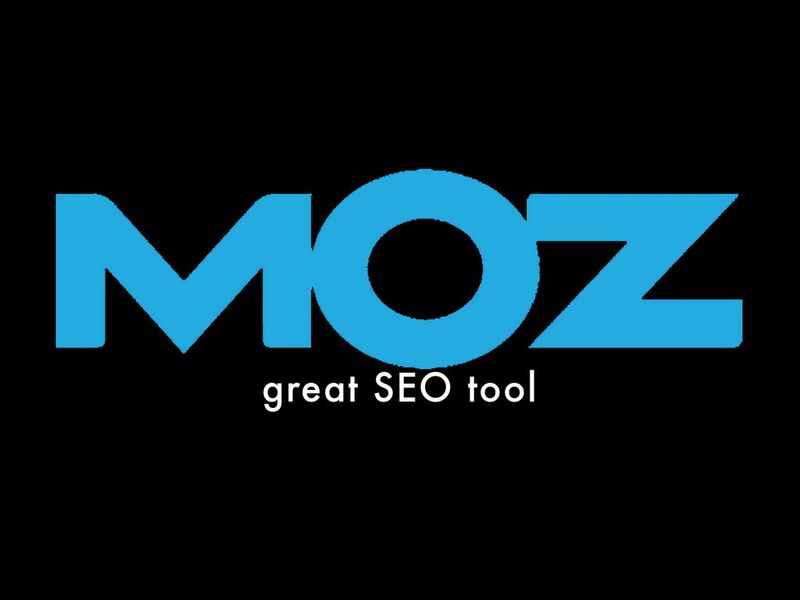 MOZ.com is a great tool set (not free) and resource guide (free for the most part). Rand Fishkin is a SEO pioneer and brilliant online marketing expert. This deck CAN'T tell you every "step on a crack, break you mom's back" SEO rule, but you can easily learn the latest rules from Moz.com (just as we do). If you haven't been to the mountain to study SEO extensively we suggest using a tool set such as Moz.com or http://raventools.com/. You need to develop knowledge before spending money on tools. Use FREE tools until you can't stand the bailing wire and chewing gum process. Ironically, the more SEO advanced you become the fewer tools you need. So use FREE tools until you can't stand it. Then use paid tools until you can't stand it or don't need them anymore. Words MATTER, but not all words matter equally. Google can't crawl all words either. Words that don't provide CONTEXT a search spider can process Google ignores (called "stop" words). If that last sentence sounded important you win a cookie. Creating COPY that understands SEO is HARD and a CSF (Critical Success Factor). I go up a hill to play with a dog. Martin Smith goes up Prospect Hill in Durham, NC to play with Spot. First sentence Google "crawls" hill and dog. 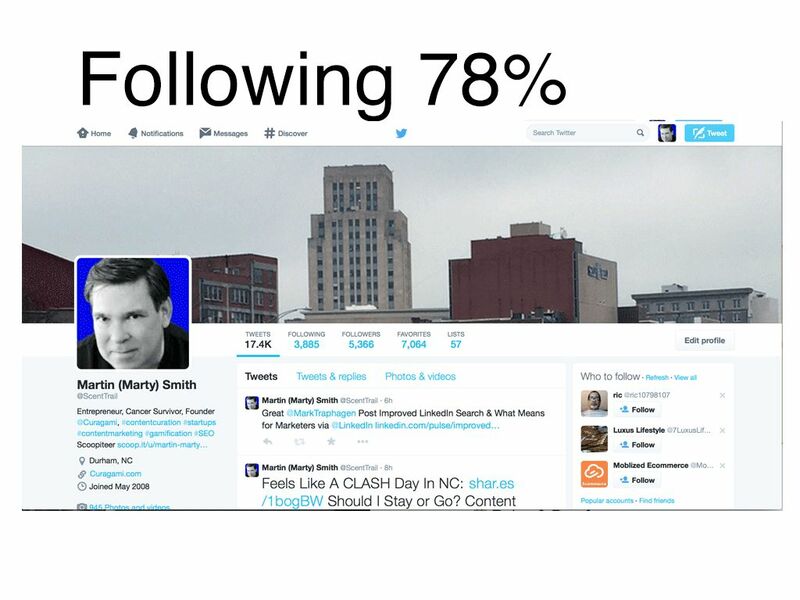 Since we want our site to rank for the keyword "Martin Smith" and we are located in Durham, NC telling a SPECIFIC story with "keywords" means our content marketing intentions are more clear to Google. As a designer you are where content marketing's rubber meets the road. 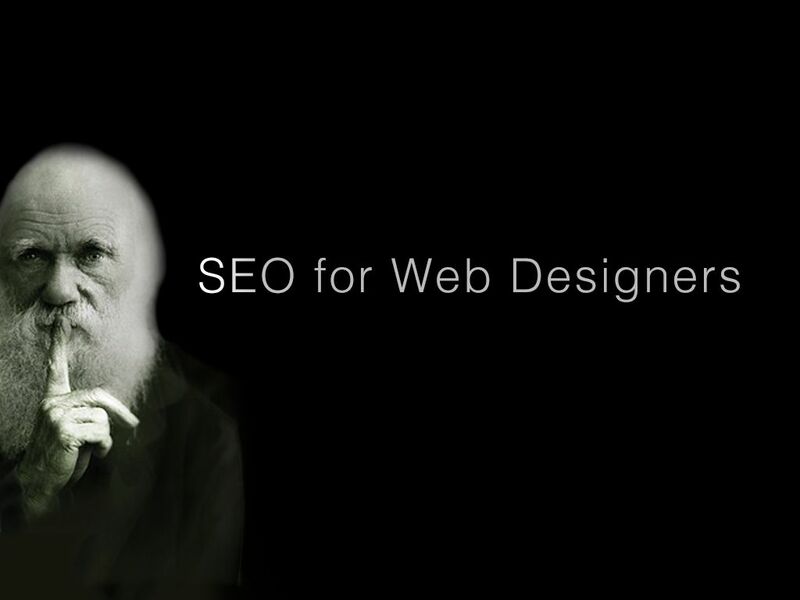 If you have multiple designers working on your site appoint a SEO CHIEF. Consistency and efficiency is valued by Google. If you use "phono" in your anchor text, another designer uses "turntable" and another leaves anchor blank DISSONANCE happens. Feeding Google consistently is more important than getting it RIGHT...well almost :). 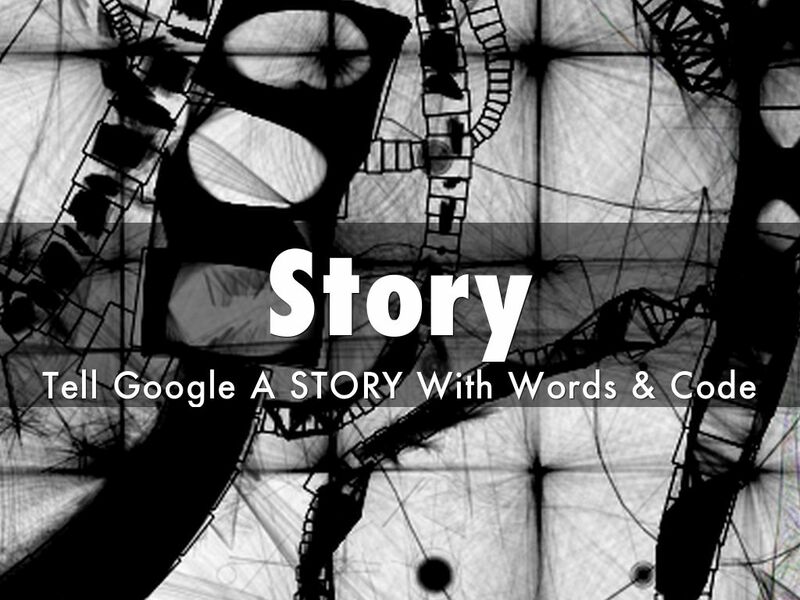 There are many ways to know the "story" you tell Google (and the world) resonates. When your content receives LINKS BACK with the keywords your content is focused on YOU WIN. When your content gets shared WATCH how customers and advocates share. Watching how people CHANGE your language, pace and tone can and should inform your marketing and design. Spiders CRAWL They Don't "Read"
Crawling means spiders go everywhere. 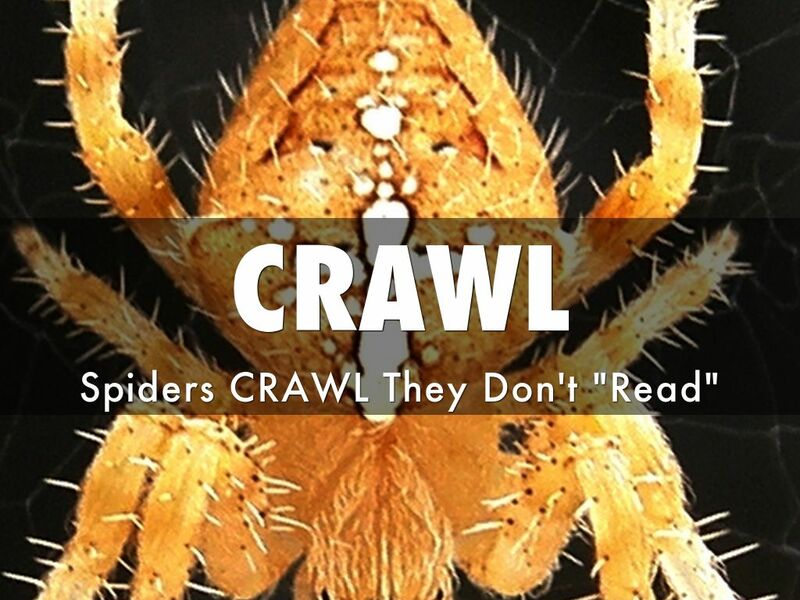 You may not WANT spiders to crawl pages such as your site's Terms and other copy lawyer forced you to publish. Create a folder on your server called "no crawl" (or something) and use the Robots.txt file to tell Google's spider to ignore (i.e. not crawl) that folder. 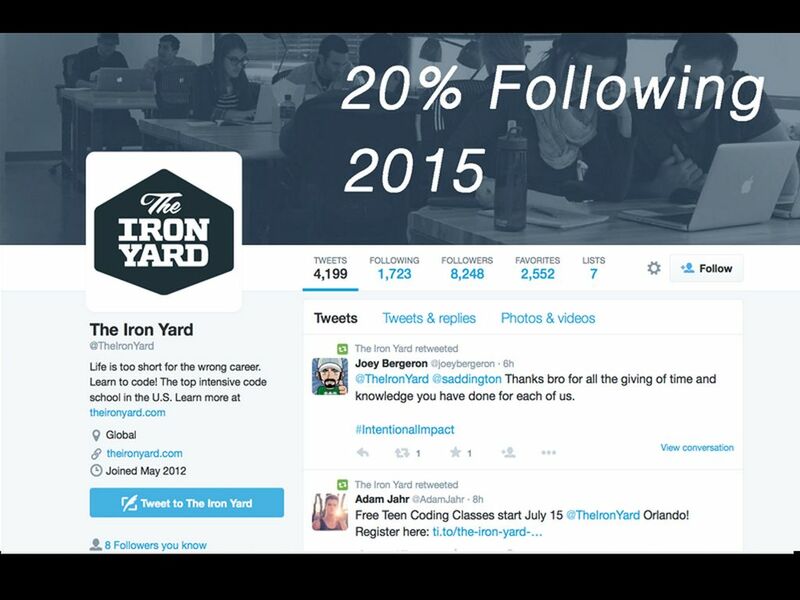 I've been asked to speak to front end designers at the Iron Yard Code Academy again now half a year later. 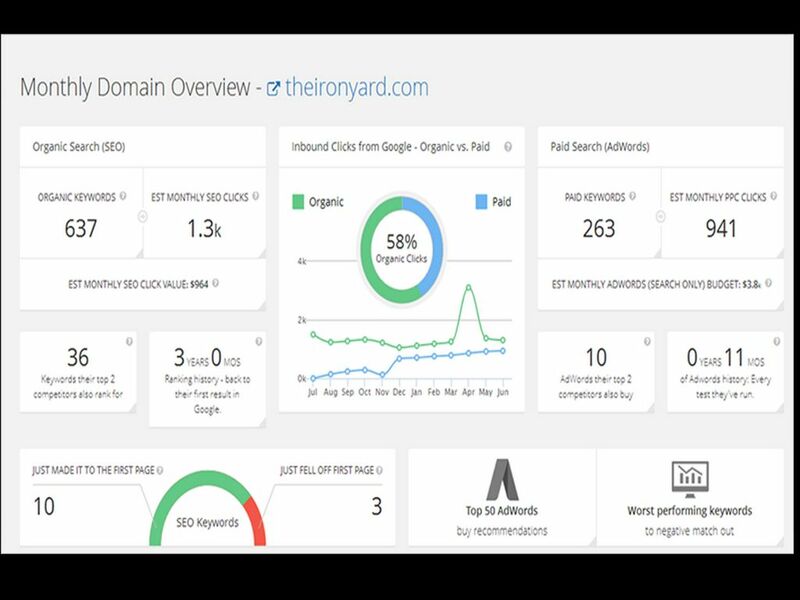 This will give us an interesting benchmark to see if the Iron Yard made progress or lost footing in SEO. This SpyFu overview shows The Iron Yard isn't "castled". We call a site with a virtual positive cycle of gaining listings from advocacy and aligned content "castled". 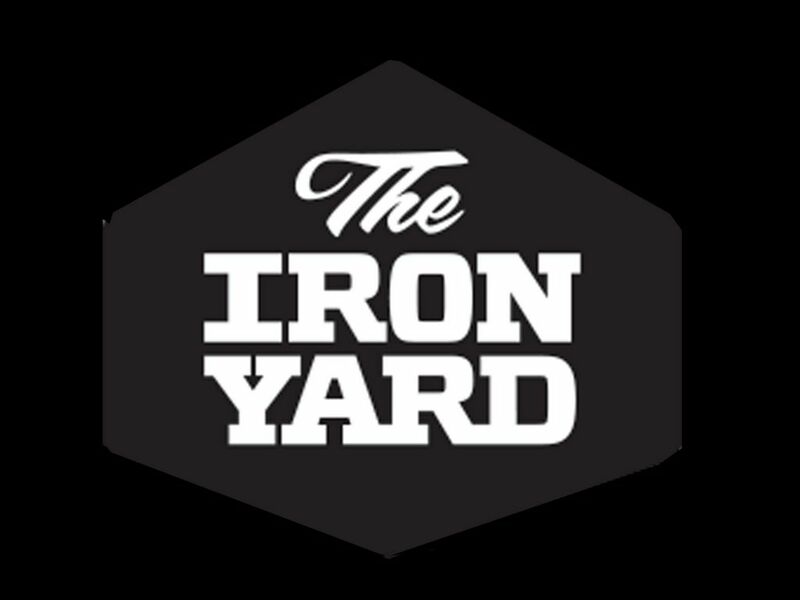 We know the Iron Yard is not castled (yet) because they are giving up 3 page one to gain 7. There is always an ebb and flow to SEO, but better to ebb in than flow out. When a site is castled flow in is square flow out. 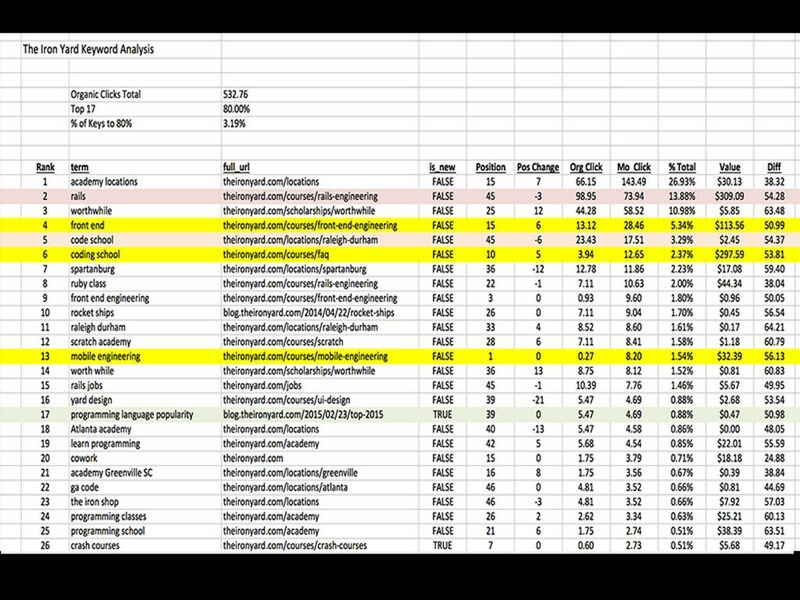 This chart shows WHERE the Iron Yard should concentrate - the yellow lines. You want high demand but reachable keys so positions 11 - 20 (page 2_ and 21 - 30 (page 3) are more valuable than keys out in the north forty. Win the winnable first and work on the next generation. Winning the winnable helps bring those in the 4th and 5th circles in closer to typically. 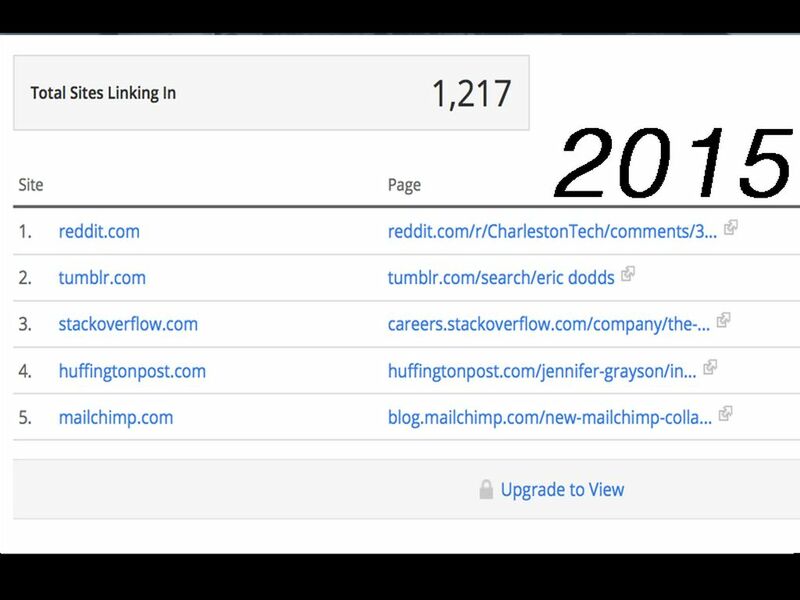 You "win" by increasing related content and/or building inbound links (which may mean asking someone who has rank on the term to link in to you). * Writing a short summary of the post and linking out to it. * Share across social media (several times). 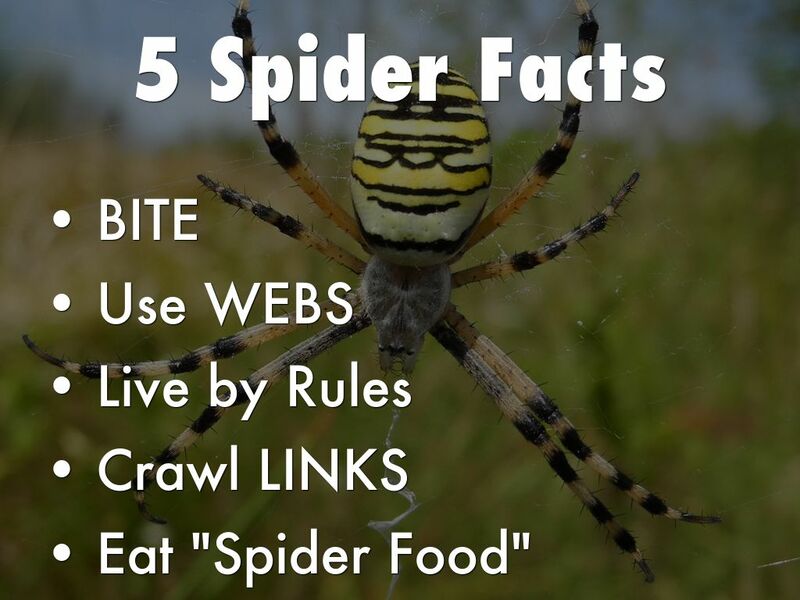 * Pull ideas from the post and build on them with links to the origin and the new content branches (remember spiders crawl LINKS internal ones And External Ones. * Watch comments and other social shares and then comment on and curate those into YOUR site's content. Don't link too much or to "bad neighborhoods" (i.e. spammy sites). Links are VALUABLE and should be treated carefully and sparingly. Be sure to THANK people who share or write about your website or content. Good idea to follow them on social media too. Details shared above are more marketing than designing, but some designers pull double duty. How you curate critical content helps you get MORE or LESS of respect and love from Google. other authoritative voices online or in your business vertical. Links in are down 35% since our baseline. There are many reasons such as Google's ongoing trimming of the web and some sites disavow links that aren't from "good neighborhoods". We are going to LEAVE the land of "web designer" for a few slides to make the Big Picture more clear. You can't win with technical SEO anymore, but it can sure turn a good site bad or a great site to good. Making sure you know your most important keywords and using them consistently across a series of "technical SEO" parameters modeled better on MOZ.com than we can do here will insure you don't suffer SEO penalties and search engine robot confusion. Don't let SEO become a preoccupation, but graphic designers should be aware of their sites' top keywords. Top keywords balance between having enough demand to make them worth getting and not so much demand ranking will be impossible. Your vision and content should drive SEO not the other way around. Don't write something FOR SEO, but do modify your content strategy to incorporate terms where you have rank and can build a beachhead of Google and Bing acceptance. In old SEO days search engine optimization was a series of interlocking rules understood by a priesthood of rule followers. Thanks to Google engineer Navneet Panda's faster way to crawl Google saw their mistake - the game as structured created solipsism or websites talking to themselves about themselves. High authority websites sold links to help lesser authority sites. People who understood how to rank "a ham sandwich" as one SEO told me one day could WIN without ENGAGEMENT. Google's model depends on the democracy of LINKS. If links can be purchased Google becomes Yahoo. In trouble Google did what only Google can do - they changed SEO and content marketing's rules...again. The question about if Google changed or change was forced upon them by social media marekting's rising tide is moot. Google had to change or become increasingly less relevant, so, despite protestations to the contrary at first, Google uses social shares, likes and shares. If you think the last sentence is packed full of dynamite you win a cookie. These days RANK and so TRAFFIC is more CROWD-BASED than ever. Granted not all "crowd" members are equal. 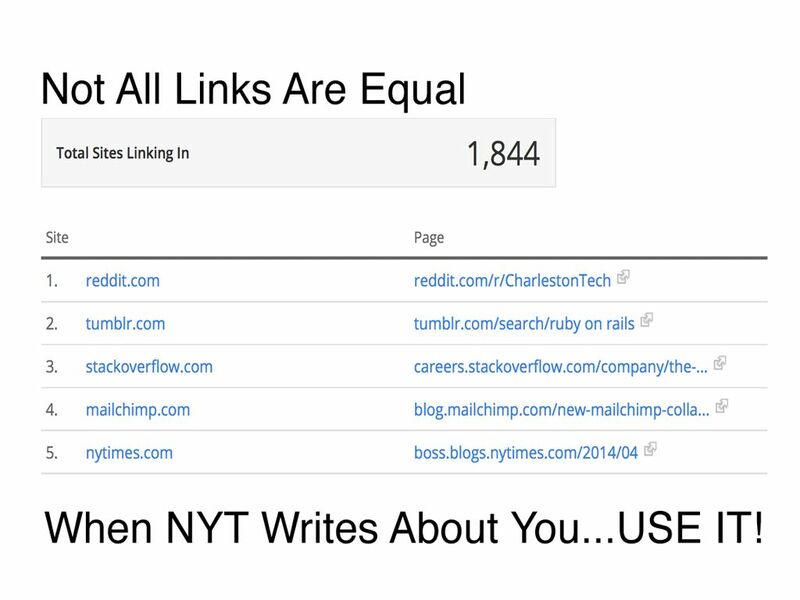 A link from NYT or Harvard is probably worth 10x a link from us, but a link from the NYT without social support creates dissonance. Google models expectations. You don't want your site to be an outlier in need of explanation. As a designer what you CAN or CAN'T do in SEO is limited. 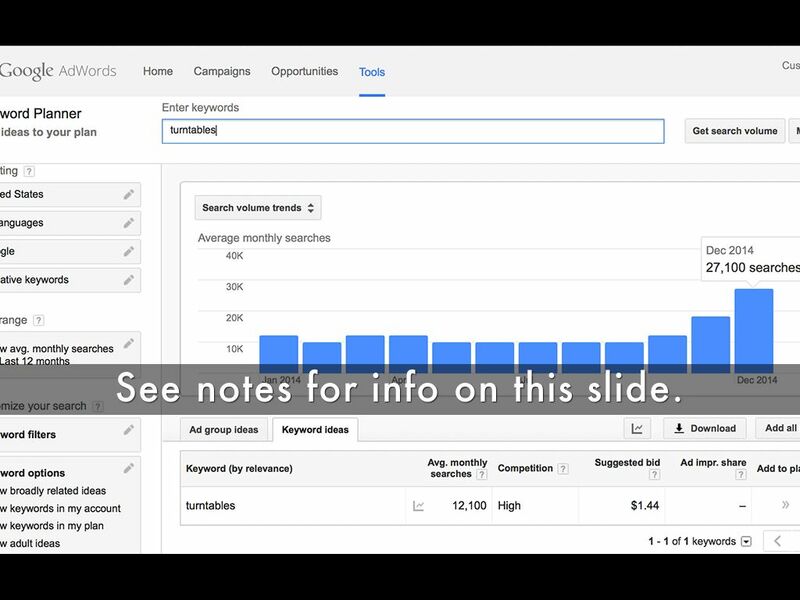 You can use keywords in titles, make your titles unique and repeat "high demand" keys in image anchor text. NO ONE can win with Google via "technical SEO" anymore. 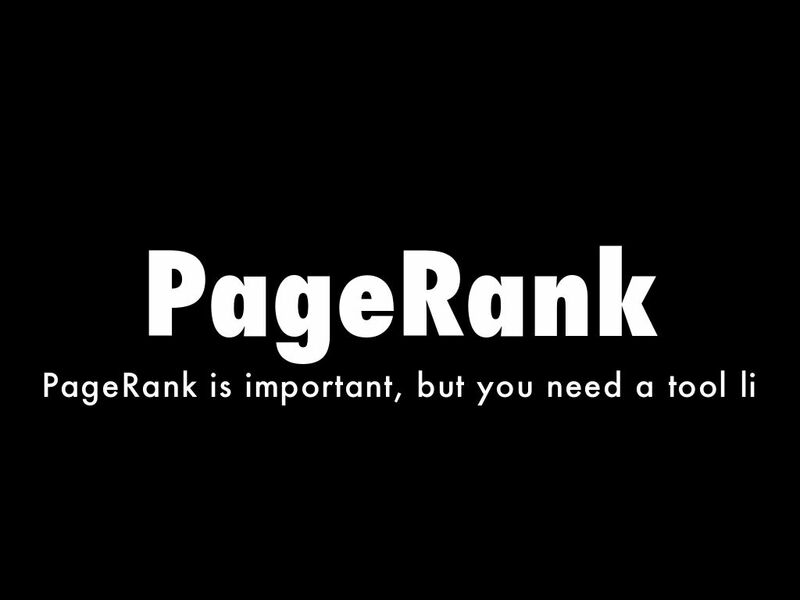 But poor SEO can take a GREAT page down to GOOD or a Good page down to AVERAGE. 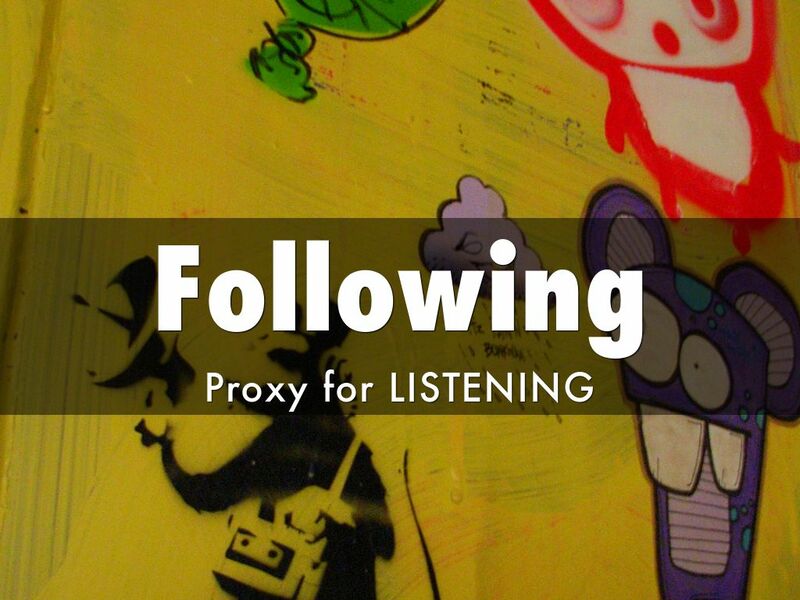 In our models we use Twitter Following & Follows as a proxy. 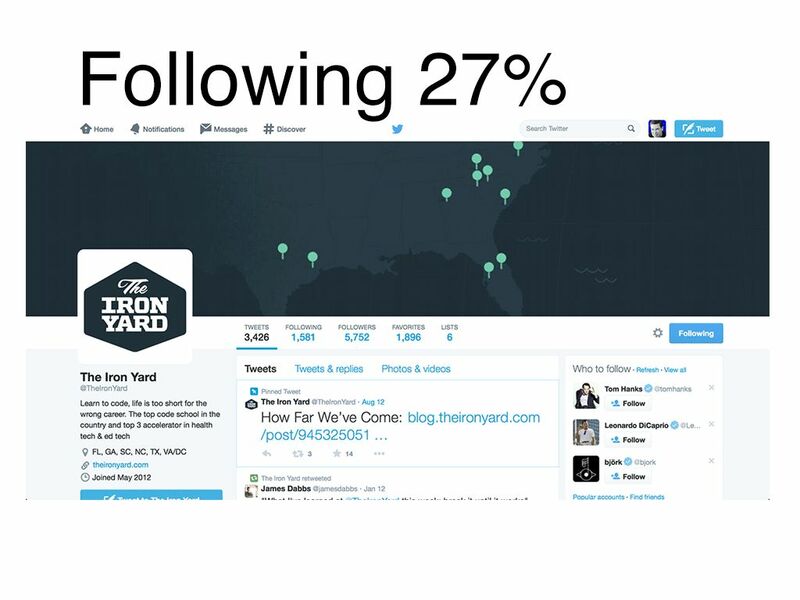 Twitter following tells us the Iron Yard doesn't yet fully grasp the 2 way nature of online communication the "new SEO" wants. Not understanding today's most important uber-goal - creation of online community - is a sin. Schools are natural networks so a few tweaks wold move the Iron Yard's somewhat authoritative PR5 to a VERY authoritative PR8. The traffic difference between those two positions (PR5 vs PR8) is HUGE since gains are exponential not linear. 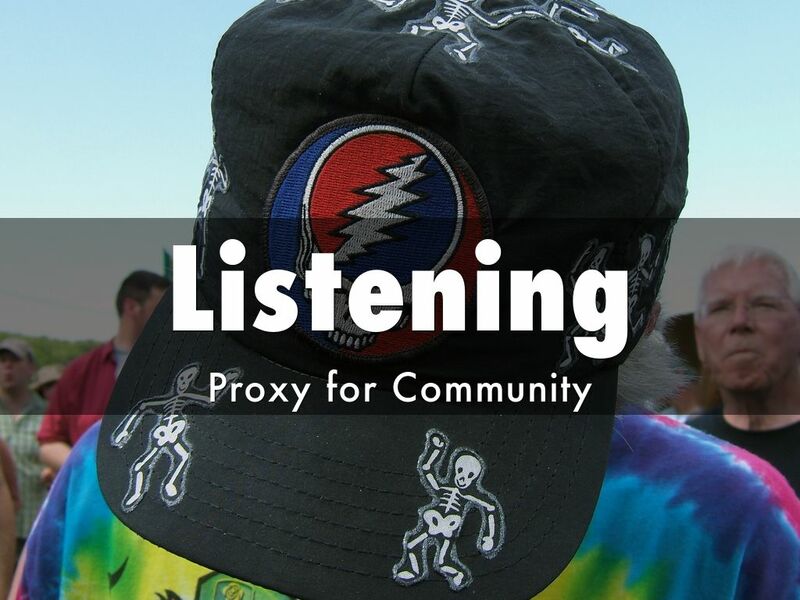 TALKING more than you listen is a shame when there is such an extended network ready to help - all you (or the Iron Yard) has to do is ASK and then LISTEN. Every business, brand and person has more network than they realize or regularly engage with. Develop creative ASKS. There is something about asking for help that feels so anti-American. Get over it, since LISTENING and ASKING are twin pillars of creating sustainable online community. * Curated content featuring community members. We used a Grateful Dead cap here on purpose. The Dead created a community so strong people quit jobs to follow and hear their "content". Give more than you take, listen more than you talk and LOVE your members and be sure to build those ideas into your designs. 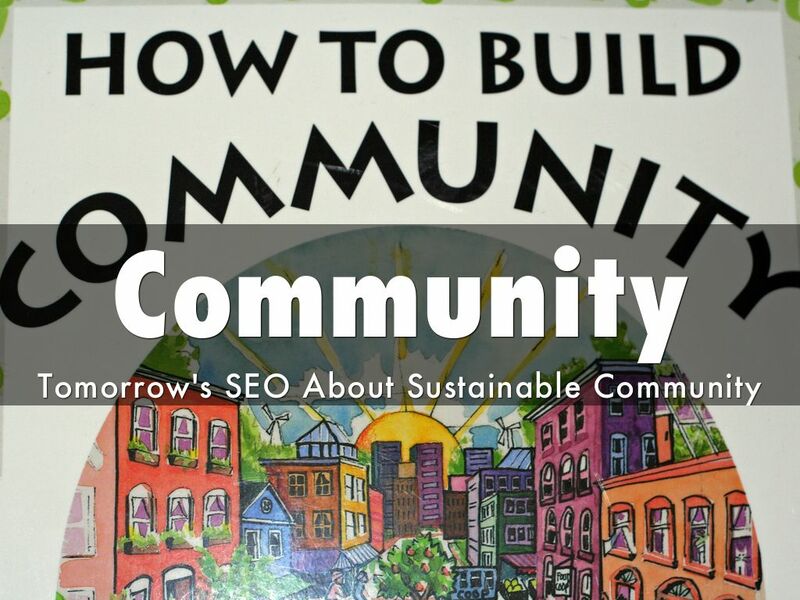 You will be amazed at the power of online community to sustain your SEO, TRAFFIC, and ROI. 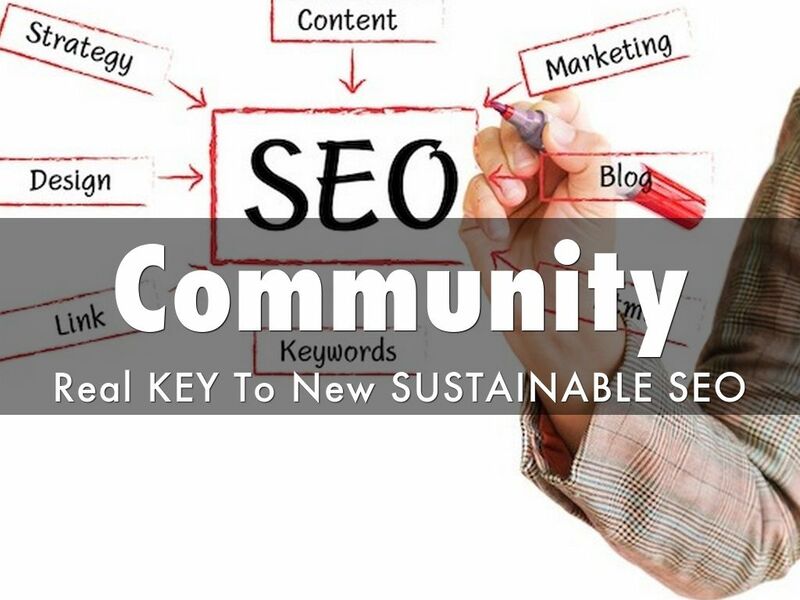 The ONLY way to sustain "SEO" now with an increasing amount of traffic from LESS work is to create sustainable online community. * Create an Ambassadors program. * Create competitions to see who is willing to BRING IT in support of your movement. * Curate content about members on a regular schedule (weekly, monthly, quarterly). * Gamify your site (i.e. reward wanted behavior with social recognition). * Give Ambassadors missions such as writing reviews, finding errors or providing competitive intelligence. DESIGN IN these ideas and community forms. So, and sorry about this, create forms, comment boxes (with cool styles since it's hard to do so and thus rare) and know when to use a PAGE social widget vs. a post widget are ways great designers help achieve a site's SEO objectives. Keywords are alive. They evolve, combine and move as culture places or removes emphasis. Keyword research from last year creates a helpful baseline, but SEE WHAT IS HAPPENING NOW. Great marketing teams let the WORLD inform their vision, language and online communication. Keywords don't age well. 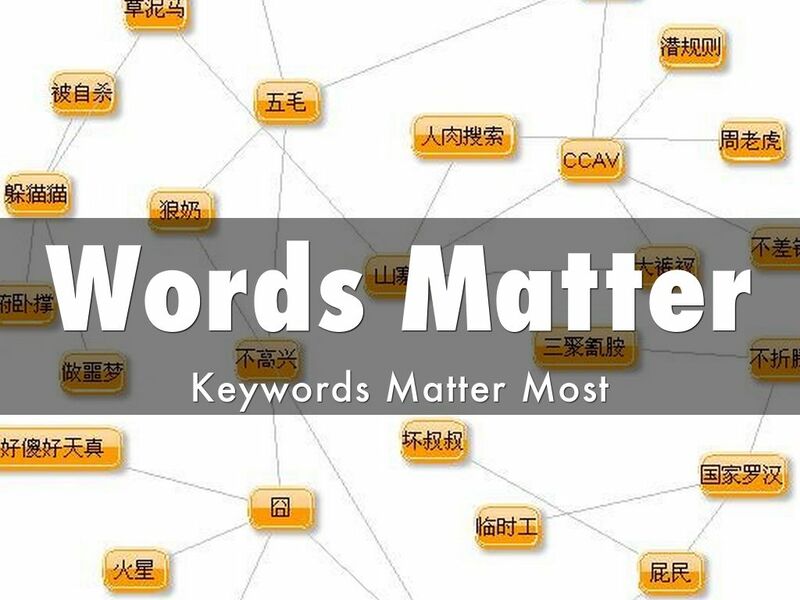 If NO ONE is doing keyword research you should. 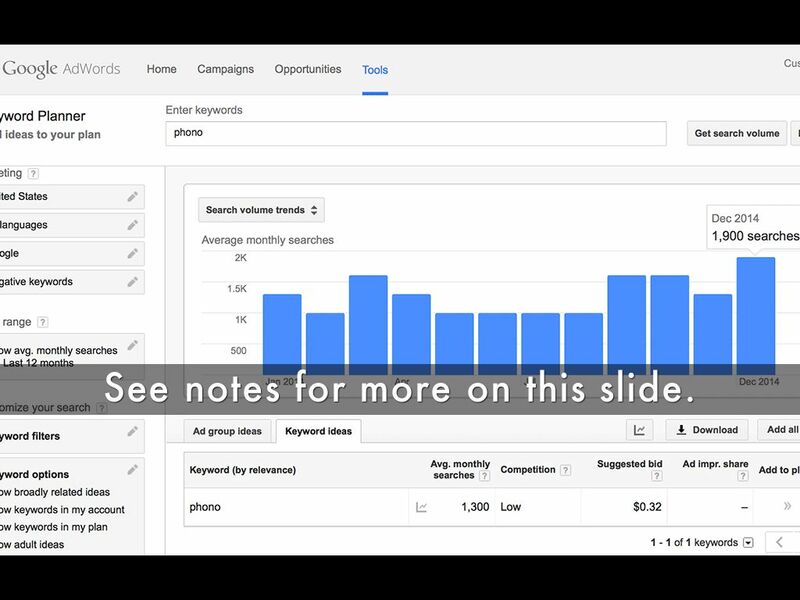 Use Google's FREE Keyword tool in AdWords to discover DEMAND and use demand to influence design elements such as names for navigation, image anchor text and H1 Tags. Plurals & Singular = Check. 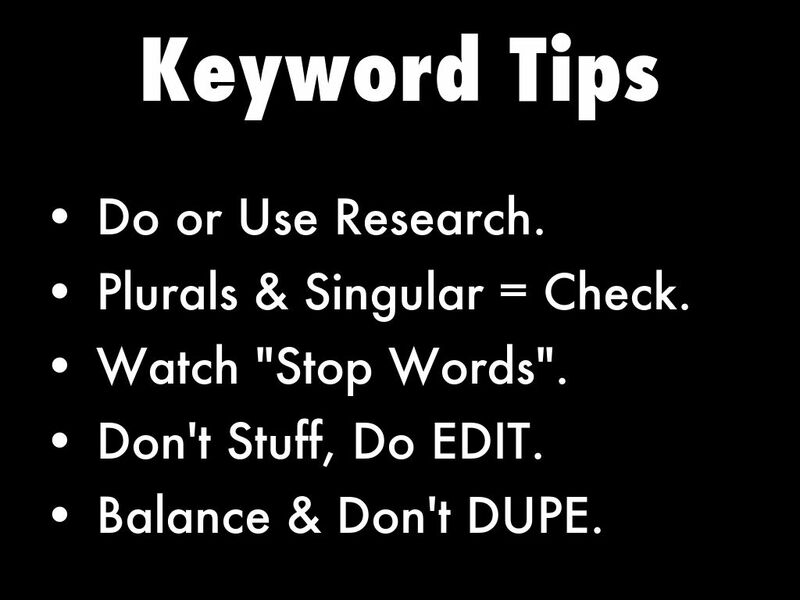 A few keyword tips from our hard won bag of tricks. See notes for more on this slide. Knowing Turntables receives many thousands more searches than "phono" means a designer should name a product category "Turntables" not Phonos. Good idea to check search volume before assigning major and often repeated variables such as navigation. Most designers receive a working brief from an owner or marketing team. Good to know KEYWORDS are your friends and not all KEYWORDS are the same in case you (the web designer) are stuck doing the research. See notes for info on this slide. Not all keywords are the same. Here TURNTABLES is crushing PHONE. 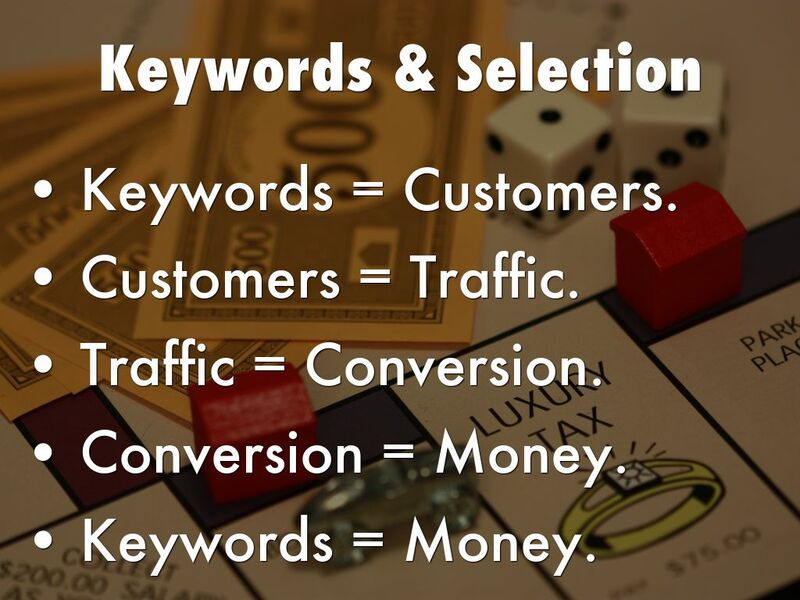 Keywords are the first step on a journey that ends with MONEY, LOVE and LOYALTY. 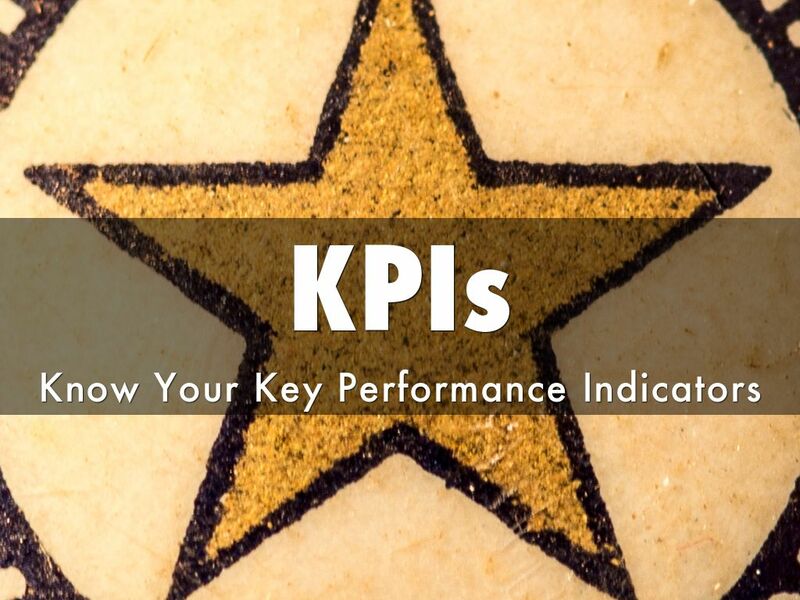 A Key Performance Indicator (KPIs) is a metric you can use to inform your online design & communication. We suggest watching 3 - 7 KPIs daily, summarizing trends at the end of months / quarter and years. Your KPIs are unique, like a fingerprint. Find what drives your business online and off and then find those metrics that effects those engines. Follow them. Track Them. Test ideas, content and new approaches to SEO. See what impact your tests have on your KPIs. Rinse and Repeat. QDF or Quality Deserves Freshness means content needs to be in constant motion. Static content loses its "Google-juice". 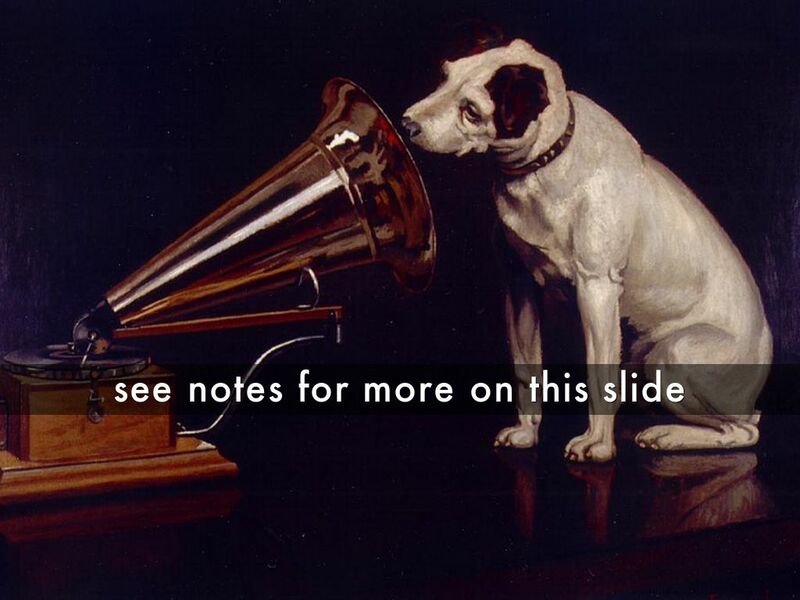 Find ways to update, revise and incorporate your content. Comments can help PIPE new content into your content, but don't hesitate to open up old and valuable content and revise with something you learned or someone shared today. Keep your content MOVING and so its QDF rating will be high and Google will care more. We love UGC or User Generated Content for many reasons keeping content fresh is a big reason we love UGC. If your design helps create community welcome to the Next Web. 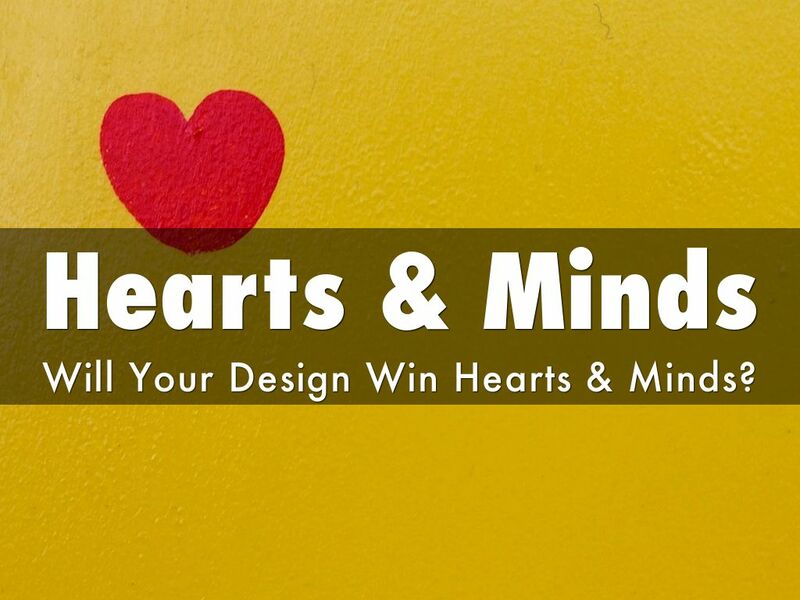 Will Your Design Win Hearts & Minds? When everyone has a website, all products are good to great we buy what we love. As marketing guru Faith Popcorn said, people don't BUY brands they JOIN them. Is your design making it easy to JOIN your client's site? Then you help their SEO more than you can know. 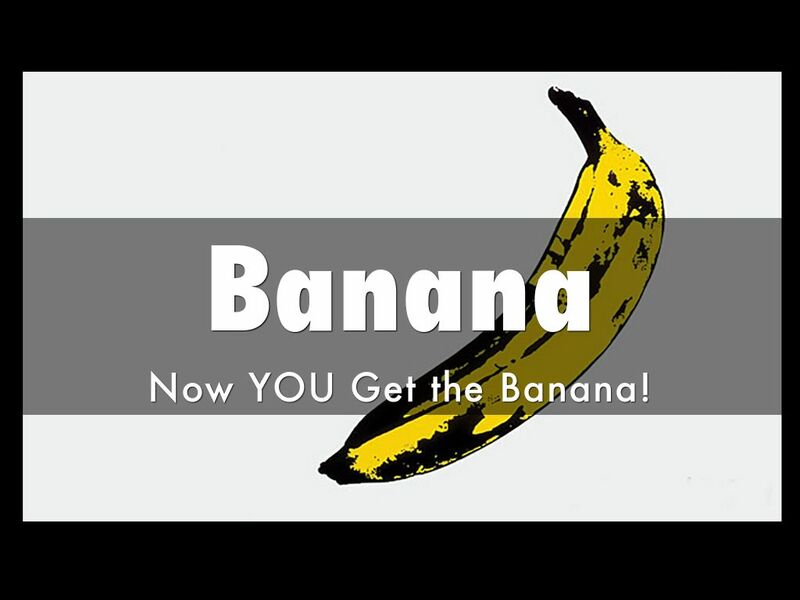 Now YOU Get the Banana! We have new found respect for our web designer friends after a week of "design school". Remember as hard as you work to stay current on design trends someone is working to stay current on SEO. Find that someone and partner with them since they can't win without you and you them.